The HA3D is a portable, stereo headphone amplifier designed for demanding and critical audio monitoring. This audiophile quality headphone amp is ideal for adding headphone feeds for portable, studio, and audio enthusiast applications. 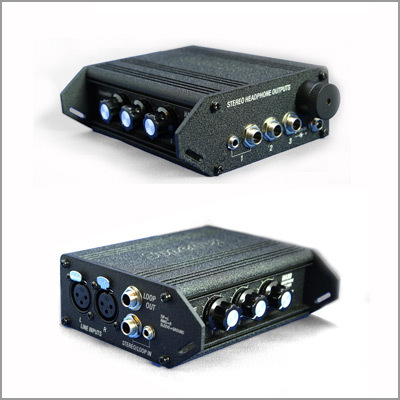 The HA3D provides 3 independent headphone feeds from balanced or unbalanced line sources. Each headphone output is controlled by the associated level control, equipped with independent peak LED, and 1/4-inch output connector. With its extended bandwidth and high current/voltage drive capability the HA3D can drive headphones of various impedances to high levels with very low distortion, important for monitoring in high SPL environments. It can be powered from two-AA batteries or external DC. The HA3D will provide years of superb audio performance under the most demanding field conditions. 3 independent headphone outputs with individual volume controls. Frequency response from 10 Hz to 50 kHz. High power driving capability, drives headphones to high levels with very low distortion. Individual peak indicators show overload of each headphone feed. Master Stereo / Mono switch. Internal battery power (2 x AA) for convenient, low cost power. Long battery life - more than 10 hours (Alkaline batteries, @ nominal drive level). Loop output to connect additional HA3D’s in series for extra headphone outputs. High strength aluminum chassis withstands challenging field conditions. Strap loops on side panels for easy mounting or wearing. Panel-mounted connectors for strength and reliability. Easy access battery compartment for quick battery changes. Power: Internal: 2 AA alkaline batteries, 12 hours life typical driving one 75 ohm headset; External: 5-17 VDC via threaded coaxial connector,(5.5mm outer diameter, 2.1 mm inner diameter), pin positive, sleeve negative. Voltages above 17 VDC cause no damage to unit, but will open an internal poly fuse. Poly fuse will reset when voltage is removed.